ITW GSE is a proud division of Illinois Tool Works. ITW GSE enjoy a global market-leading position producing ground power and pre-conditioned air units as well as supplying cables and hoses. Prior to April 2018, we sold our products under the AXA Power, Hobart, Houchin, Military and J&B Aviation brands. ITW GSE is part of Illinois Tool Works (ITW), a Fortune 200 corporation with over 100 years of history. ITW is a diversified manufacturer of advanced industrial technology that employs nearly 51,000 people worldwide and is based in Glenview, Illinois, USA, with operation in 56 countries. Read more about Illinois Tool Works. As part of an ongoing brand consolidation process, we merged our legacy brands in 2018. 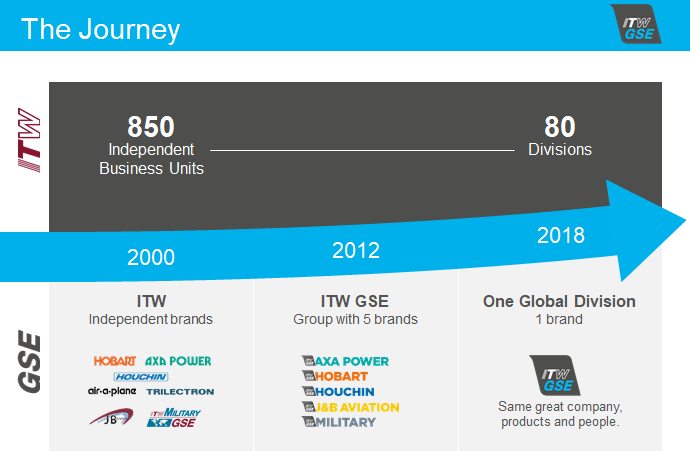 Since then, we sell the entire ITW GSE portfolio under one single name “ITW GSE.” Our name has changed, but rest assured that we still sell the same great power, air, cable and hose solutions you depend on. And we are still the same people, grateful for your business and eager to serve you. Every day, the aviation industry is met with new and increasing requirements from airports wanting to go cleaner and greener. ITW GSE naturally takes responsibility to help solving our customers’ needs and pains by developing and supplying the cleanest, most reliable and cost efficient GSE systems to the aviation industry as per our vision. Actually, ITW GSE has done so since the 1980s when ITW GSE introduced its first solid-state ground power units.